← Just Zip It. Don’t Enter into Political, Racial or Religious Discussions on Social Media. Excellent post, Elyse. You are right. Society and the media would have us think otherwise, but we are connected to each other through our humanity, so we help. Connected by our humanity – YES, you said that brilliantly. Thank you! There is a Good News TV station and Huffington Post has a good news site. I try to post at least one of them every day on my facebook page. I love that and once heard that “people don’t like to hear good news” which is why it’s always the last 5 minutes of a news broadcast and it’s all death, murder, mayhem. I like good news. I try to post stuff like that occasionally on my FB page as well. Oh yes, we are connected, wonderful story what you did to the lady. And my 4th book is called Talon, Connected. Thank you for sharing. You are quick to assess a situation and that is a gift. Sometimes people linger because they feel a need to know the person is ok, some may be praying. Connection must be a need that is in the forefront of people’s hearts at the moment. The Minute Meditation on my blog today is about connection too. When an emergency arises, people step forward to help. 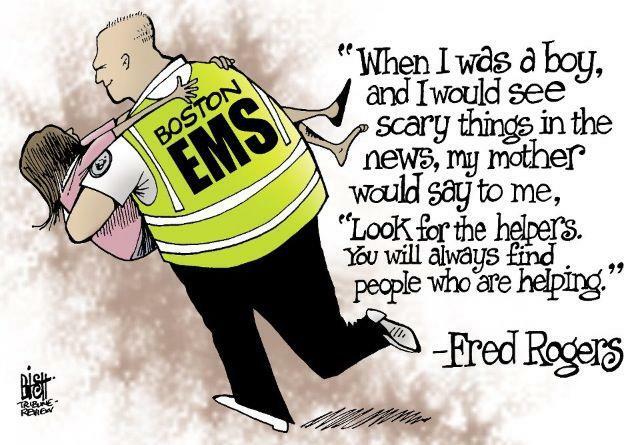 That happens throughout our country and makes us proud of the helpers. I like the idea that we can be “helpers in waiting” even when we don’t know what should be done. I once slipped on ice and hit my head. It was so comforting to have people rush to my aid and help me get medical help right away. I’m sure that old lady felt the compassion that surrounded her. In a world that seems to only want to share negativity, it’s refreshing to hear stories of help and kindness like this. On my long drive to/from work, if I see a car broken down, I will call the state trooper hotline to send help. Wow Elyse! This is such a great story and restores my faith in humanity. You are so right. It doesn’t take much to help out when and where we can. Way to go girl! Great story, great post and totally resonate in many ways. Great stuff!